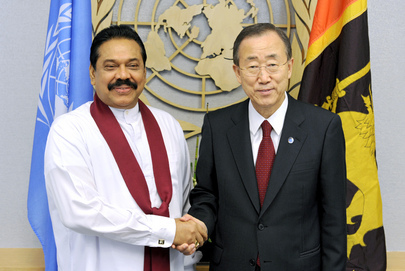 UNITED NATIONS, September 29, 2010 -- Five days after UN Secretary General Ban Ki-moon and Sri Lankan President Mahinda Rajapaksa met and then issued different summaries of their meeting, Inner City Press asked Ban adviser Nicholas Hayson to explain the discrepancy. Haysom admitted that after the “open” meeting between the two men, which included advisers including Haysom, there was a “tete a tete” meeting, one on one, which the UN did not include in its purported summary of the meeting(s). 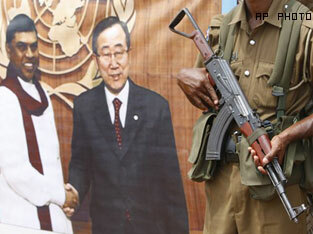 Inner City Press asked how many of Ban's bilateral meetings include separate one on one discussions. One in ten, Haysom estimated. Inner City Press asked, why not include the contents or at least topics of these rare addendum to meetings in the UN's summaries? Haysom defended the omissions, saying that these tete a tete meetings often included “staff issues” or other private issues. While Ban's Spokesman Martin Nesirky pointedly cut off follow up questions, it is amazing that the UN would now claim that the issue, even the name, of its panel on accountability in Sri Lanka is a private or secret issue. And if it is so secret, why allow Rajapaksa to publicly make representations about the “private” portion of the meeting, and then have no response? Inner City Press wrote about the discrepancy over the weekend, and asked about it on Monday, September 27. Nesirky declined to comment on what the President said, despite the fact that it calls into question the completeness and even accuracy of the other summaries his Office has issued -- or at least one tenth of them. Watch this site.